Farmer’s lung, also known as extrinsic allergic alveolitis or hypersensitivity pneumonitis, is an allergic inflammatory reaction induced by inhalation of Aspergillus spores, often in exposure to mold and hay. It usually occurs after inhalation during an overwhelming exposure to spores. A multitude of other antigenic stimuli can induce a similar syndrome. Other examples of hypersensitivity pneumonitis induced by Aspergillus include compost lung, tobacco worker’s disease (from mold on tobacco leaves), and malt worker’s lung (from moldy barley). Symptoms include cough and shortness of breath, which generally develop 6-8 h after exposure. On occasion, fever and chills may be present. The presentation tends to be acute, but subacute and chronic forms of the disease may be present when there is chronic low-level exposure. Neutrophilia may be seen, but eosinophilia is typically not present. Aspergillus serum precipitans will be elevated in most cases, but their presence is not diagnostic. Skin testing with Aspergillus antigen may be positive but is not diagnostic and is most helpful for epidemiological purposes. Chest x-ray findings may be normal even in patients with significant symptoms. Conversely, the chest x-ray may show diffuse bilateral pulmonary infiltrates or discrete nodular infiltrates. With more chronic symptoms, pulmonary function testing may show a restrictive pattern. 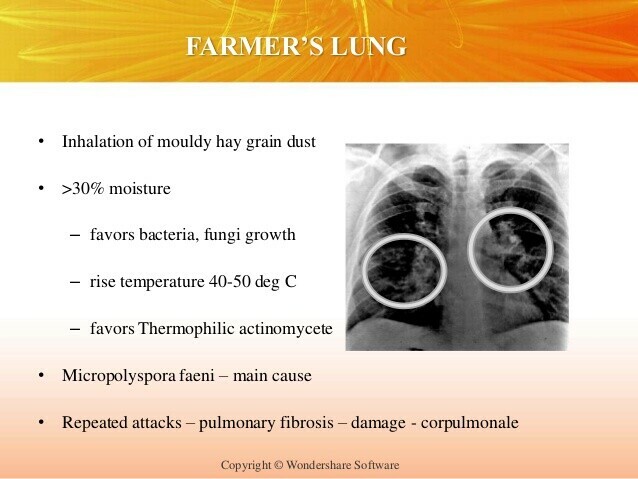 Acute and subacute Farmer’s lung will occasionally resemble an infectious pneumonitis. Farmer’s lung must be distinguished from other conditions that cause respiratory symptoms and pulmonary infiltrates, including collagen vascular diseases, eosinophilic pneumonitis, and drug-induced lung disease. In its more chronic form, it may resemble idiopathic pulmonary fibrosis and other interstitial lung disorders. Recovery from acute Farmer’s lung is the most common outcome. Individuals with chronic exposure and ongoing allergic reaction may develop pulmonary fibrosis with a restrictive pattern seen on pulmonary function testing. The diagnosis should be suspected from the history of exposure and the symptom complex. Laboratory testing can help distinguish Aspergillus-induced Farmer’s lung from other causes of Farmer’s lung. 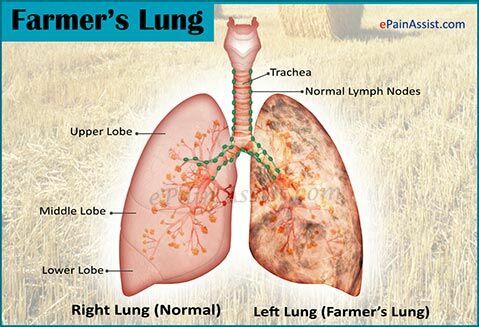 The optimal treatment for Farmer’s lung is removal or avoidance of exposure. In most individuals, the syndrome is self-limited; however, patients with prolonged subacute or chronic symptoms may require prednisone therapy (see Box 2). In most individuals, symptoms are self-limited, especially when the source of exposure can be avoided or removed. In patients with more chronic symptoms, with exposure avoidance and short-course prednisone therapy, the prognosis is excellent. 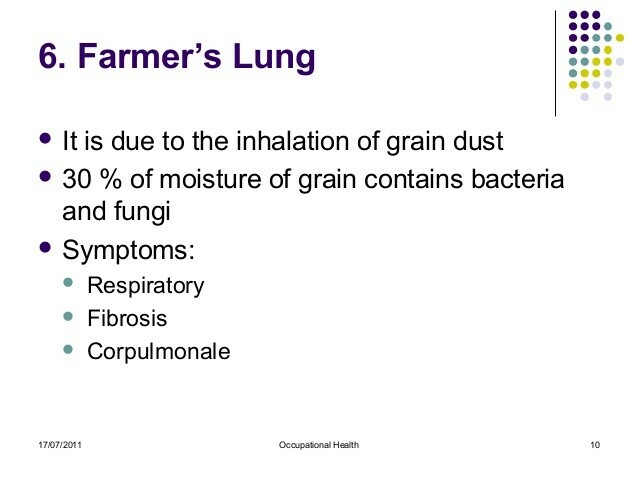 The cornerstone of prevention of Farmer’s lung involves identification and avoidance of exposure to Aspergillus spores. Since the majority of individuals will not develop a hypersensitivity reaction after exposure, prevention and control measures only need to be instituted after the initial diagnosis.